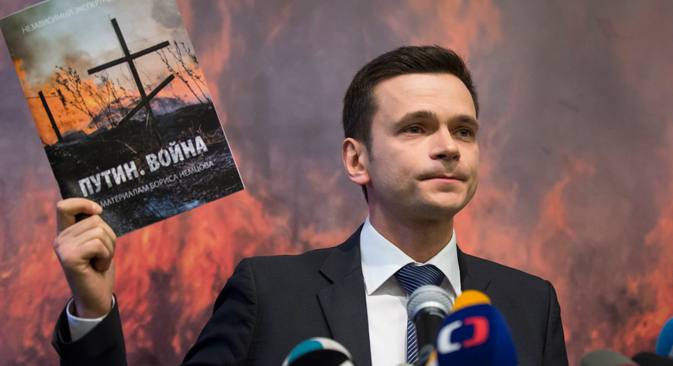 The associates of murdered Russian liberal politician Boris Nemtsov have published his report dedicated to the supposed participation of Russian forces in the Ukrainian conflict. However, sources interviewed by RBTH believe that the report will go unnoticed in Russia. Friends and associates of opposition politician and former Russian Deputy Prime Minister Boris Nemtsov, who was murdered just yards from the Kremlin in February 2015, have published the report about Russia's alleged military participation in the conflict in southeast Ukraine on which Nemtsov was working when he was assassinated. The gathering of information for the report, titled “Putin. War,” could have been the motive for Nemtsov's murder, according to one of the theories circulating in Russian society. The report was completed by his colleagues and close friends after his death. The text itself is a compilation of information published earlier from open sources (first of all from the media), information about the support given by regular Russian army units to the rebels in the Donbass region of southeast Ukraine. For example, soldiers were offered to leave service in order to become "volunteers" and organizations loyal to the Kremlin then sent them to the Donbass to fight against Ukrainian government troops attempting to regain control of the region. The report says that these organizations also financed the real Russian volunteers – for example, former soldiers and members of the Chechen power structures. Their average salary, the authors of the report affirm, was 60,000 rubles a month ($1,200). The average salary in Russia, according to January 2015 data from the Ministry of Economic Development, is 31,200 rubles or $620 a month. Military technology also served to compromise the official version of events, according to the authors of the report, who cite the Tornado-S multiple rocket launchers, which, according to the Minsk Agreements, the rebels were to pull back from the frontline. “This system is developed in Russia, it was never exported – this is exclusive technology," said Ilya Yashin, a member of the RPR-PARNAS Political Council, during the presentation of the report on May 12. According to the report's co-author Sergei Alexashenko, ex-first deputy chairman of the Russian Central Bank and director of Macroeconomic Studies at the Higher School of Economics in Moscow, "46 billion rubles ($9,200,000) were directly spent on the 'volunteers' in the 10 months of war." Yashin told RBTH that a lot of unfounded information “had to be cut out” of the report. “But everything that we published corresponds to reality and has been verified in various sources,” he said. According to the authors of the report, the scenario dealing with the return of Crimea to Russia had been planned by the Russian government back in the summer of 2013, when Russian President Vladimir Putin's rating began to fall. The report says that Russia started hitting the Ukrainian economy first: regular gas wars, the introduction and repeal of a food embargo, giving advantageous credit on non-market conditions to Crimean businesses and so on. “The revolution in Kiev and President Viktor Yanukovich's escape from the country… created ideal conditions for the Kremlin's decisive action to annex Crimea,” said Yashin. However, Putin never intended to unite the Donbass with Russia, said Yashin, who explained that the region had a more useful function: “The Donbass became a lever of pressure on Kiev and the West,” he said. As a ceasefire condition Putin may be able to achieve the recognition of Crimea as Russian territory and the cancelation of sanctions. For now the report has been published in just 2,000 printed copies and on the internet. The authors have already begun collecting money for an additional print run and are hoping to reach a maximum audience within the country. “Putin. War” will almost be unnoticed in the Russian reality, said Konstantin Kalachev, director of the independent Political Expert Group, who argues that the publication came too late. According to Kalachev, Russia is tired of the Ukrainian subject and only people outside of Russia will show any interest in the report. "It is naïve to think that people will read it and will drastically change their position," says Professor of the Political Sciences Department at the Higher School of Economics Leonid Polyakov, a Kremlin loyalist.